It seems clear to me now that attempting to wrangle the varied material posted here into some semblance of organized arrangement was doomed from the outset to be unsuccessful. 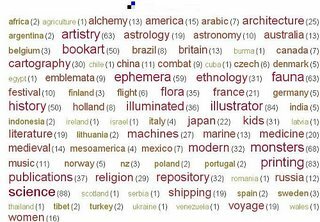 The last few days I've been posting all the entries at BibliOdyssey to the social bookmarking site del.icio.us to help make it easier to find things. I did this for myself essentially but it may be of use to people if, like me, the idea of loading 15 or 20 Mb pages from the weekly archives list is an aggravation. It's 'unsuccessful' because it's impossible to wrangle art, literature, science and history and their related images into succinct and sensical tags. Mostly. Sometimes it's the image, sometimes it's the book, sometimes it's the illustrator that is the main focus. I might work this out when I go through the post but it doesn't mean that the way it's tagged is intuitive for others. So I've added comments to the del.icio.us entries to make it all a bit easier. In some cases a new link has been added with the comment. Now and then I've put the main link from the post into the comment field to take a step out of the process. Generally I tried to describe the images in the post in addition to the factual information - date/name/title &c. It might be a couple of days until everything is indexed and available from the search box. Anyway, it's done now. The tags aren't perhaps immediately logical but it's about the best I could come up with for various reasons [the edited paragraphs not above]. It helps me if I add the words 'tends to be about or relate to' before each tag. Regional spread isn't reflected in the tags. Country tags are only used when they are actually relevant to the material in the post. 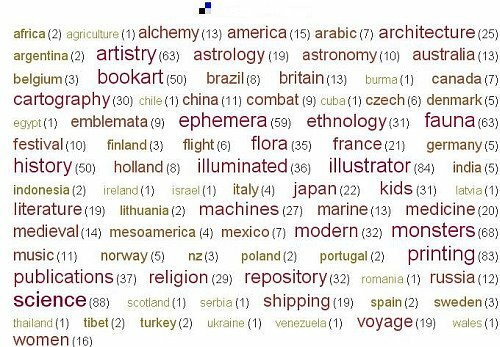 Some of the tags (history and medieval particularly) are redundant and/or useless. No doubt I will tweak them as it occurs to me. I'll add a link to the del.icio.us site to the sidebar shortly. Feel free to make any suggestions or castigate me as seems appropriate. Now, where were we...? Herman Potočnik (pseudonym Hermann Noordung) (1892-1929) from Slovenia was a bridge builder with the Austrian army during WWI. After the war he studied electrical and mechanical engineering and specialized in rocketry. Although sick with tuberculosis Potočnik wrote a book Das Problem der Befahrung des Weltraums - der Raketenmotor ('The Problem of Space Travel - The Rocket Motor') which was published in 1928 but dated 1929. He died within months of its publication. This book is an engineering guide for space travel and is remarkably accurate in many of its predictions/recommendations. Potočnik "deals with issues such as weightlessness, space communications, maintaining a habitable environment for the crew, and extravehicular activity." "The most often cited of Potočnik's original ideas are: the geostationary satellite, the residential wheel in space, the cylindrical observatory and the solar thermo-mechanical electric energy power station." 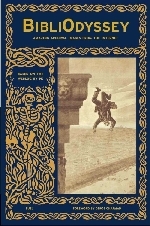 Potočnik made some mistakes in a few calculations and these were the immediate focus of attention when the book (with 100 illustrations) came out. Obviously he didn't get the opportunity to address the criticisms or correct the errors so it wasn't until 30 years later that Potočnik's work received wider recognition. Some of the diagrams and some german translations of sections from the original Slovenian were circulated however. 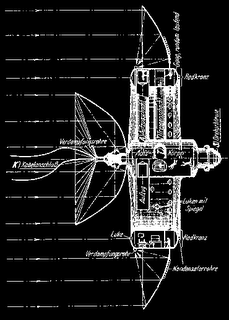 Arthur C Clarke relied upon Potočnik's work when he outlined an idea for mass communication using geostationary satellites in the 1940s. 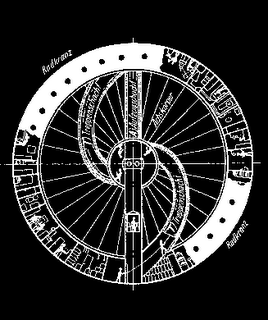 "His space station consisted of up to three modules: the "Wohnrad" (Inhabitable Wheel), the power station and the observatory. The modules would be connected by cables. The inhabitable wheel has the form of a giant wheel and rotates to simulate gravity in the living areas. 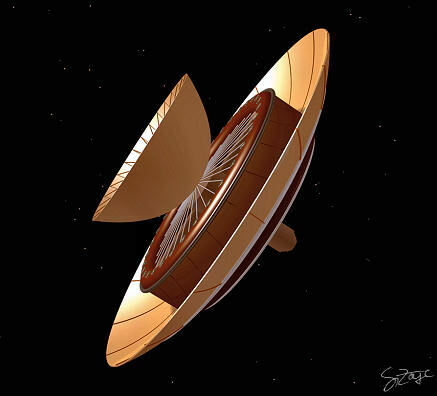 On top of the wheel there would be parabolic mirrors mounted to concentrate the solar radiation for the power supply through a heat engine power station." The final image above - the Space Station Habitat Wheel - is available in many sizes from NASA. 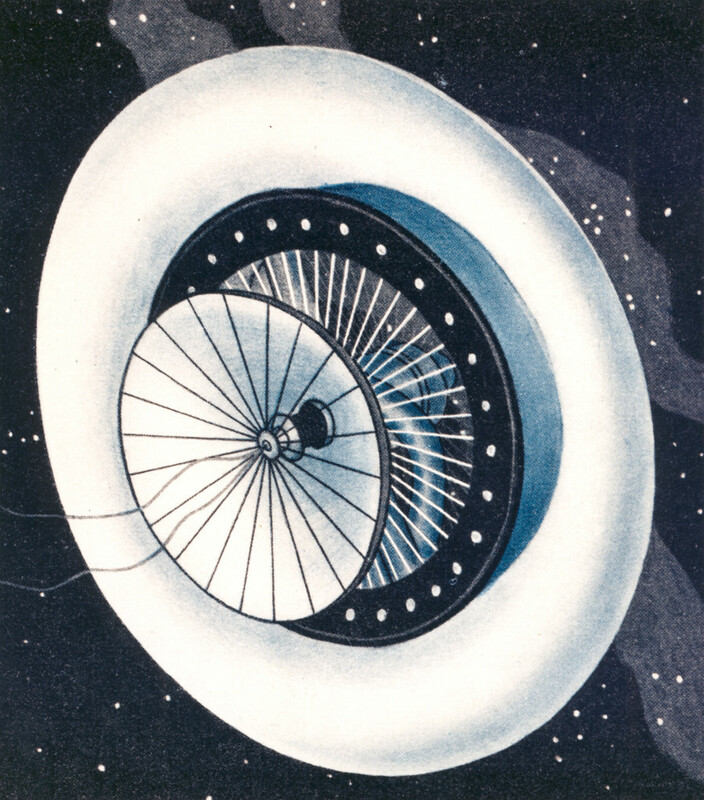 Encyclopedia of Astrobiology, Astronomy & Spaceflight. There seems to be about 7 or 8 original illustration and an outline of the book at the Slovenia Expo site. The rest of the images come from the Noordung Museum. Basics of the Geostationary Orbit by Dr. T.S. Kelso. check out for Dragan Zivadinov (Živadinov in Slovene)... he is Slovenian main promotor of Noordung. roar_ljoekelsoey thanks for that - I saw 'theatre' mentions searching but I didn't take a close look.